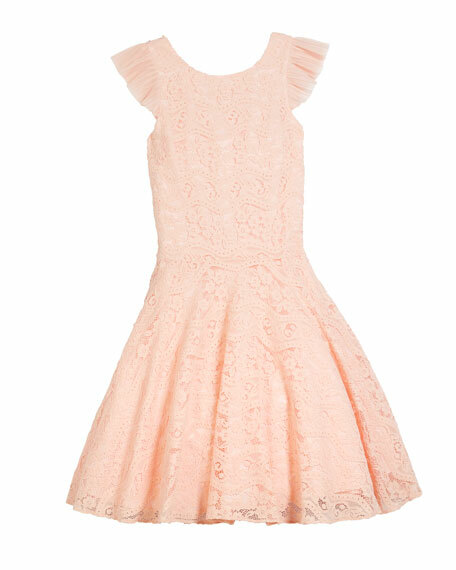 David Charles floral lace dress. 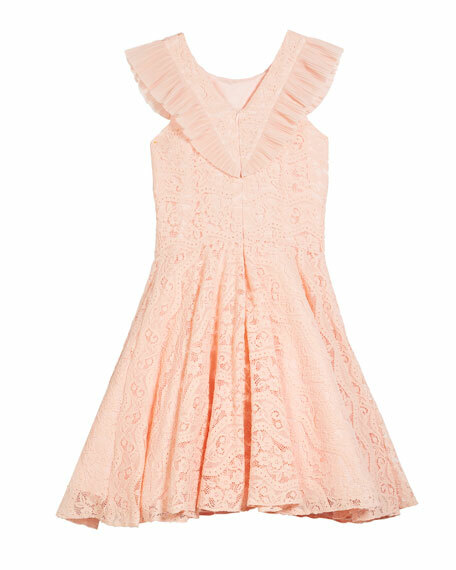 Ruffle trim through sleeves and back. Founded by husband and wife David and Susan Graff in 1970, David Charles has grown to become the most coveted and admired name in party wear and dresses for special occasions. David Charles was the first to translate women's high fashion trend into irresistible designs for little girlsmaking dresses that make girls feel gorgeous. For in-store inquiries, use sku #2537595. Fendi cocktail dress in stretch crepe. Crew neckline. Cap sleeves. Lace yoke insets. Ruched darts at bust. A-line silhouette. Midi length. Back zip. Acetate/viscose. Nylon trim. Embroidery, viscose/nylon. Made in Italy. Fendi dress in floral-print chiffon. Crew neckline. Long lace sleeves. Shoulder epaulettes. A-line silhouette. Banded waist. Pleated skirt. Knee length. Back zip. Silk. Trim, nylon. Ribbon, nylon/viscose. Made in Italy. Givenchy cocktail dress in wool crepe with lace sleeves. Crew neckline with keyhole front. 3/4 blouson sleeves. Side slip pockets. Shift silhouette. Mini length. Back zip. Wool. Made in Italy. Misha "Constance" lace dress with sheer hem. Approx. 41"L down center back. Off-the-should neckline. Long sleeves. Body-conscious silhouette. Hidden back zip. Draped back detail. Mini-length illusion. Knee-length hem. Scalloped trim. Polyester/nylon self. Polyester/spandex lining. Dry clean. Imported.